You’re a blue jeans guy through and through. And when you wear these Wrangler Riggs Men's Dark Stone 3WCV2DS Cool Vantage Carpenter Jeans, you won't trade comfort for durability. If you think wearing durable workwear means spending your day in heavy, hot, sweaty ... (see full details) (see specifications) #3WCV2DS. You’re a blue jeans guy through and through. And when you wear these Wrangler Riggs Men's Dark Stone 3WCV2DS Cool Vantage Carpenter Jeans, you won't trade comfort for durability. If you think wearing durable workwear means spending your day in heavy, hot, sweaty work pants, we're here to change your mind about how comfortable and dry sturdy work jeans can be. Sure, these Cool Vantage carpenter jeans are made of a 14-ounce heavyweight denim in a 70% cotton and 30% polyester blend, so they're tough and sturdy, just the way you want them. 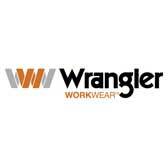 And Wrangler amps up the comfort and keeps you drier with Cool Vantage technology that wicks moisture 5 times faster and also offers the comfort of unrestricted movement. Say so long to hot, clammy denim that traps moisture, making you sticky and uncomfortable, and say hello to comfort. And that's not all. These men's work pants are made with the Riggs features you expect -- like a Room2Move® fit, an action gusset, and improved fit in the seat, thigh, knee, and bottom opening. The fit is relaxed, and the rise is high for comfort and coverage. They close with a sturdy #5 YKK zipper and a button fly, and they're made to fit over your boots. And they're built Riggs tough with triple-needle stitching and 3/4-inch x 2 /14-inch belt loops. Even the pockets are made for sturdy durability. You'll enjoy an oversized watch pocket and two 13-inch front scoop pockets with a patented tape measure reinforcement on the right front pocket. The back pockets are reinforced at stress areas and lined with 1000 Denier CORDURA® fabric. These are carpenter pants, so there's tool pocket detail and a right side hammer loop. Say goodbye to designs that trap moisture and hello to men's work jeans that wear tough and wick moisture to keep you dry and cool. Once you try these Wrangler Riggs Men's Dark Stone 3WCV2DS Cool Vantage Carpenter Jeans, you won’t go back. We have them at Working Person’s Store. Order yours today and enjoy the cool comfort. Wrangler Riggs Jeans: Men's Dark Stone 3WCV2DS Cool Vantage Carpenter Jeans is being added to your cart.